Selecting perennials to look good year-round and weather the seasons outside our wall (and next to the freeway) has been a challenge! With its own group of microclimates and an often-harsh growing climate—including high winds and both flooding and drought conditions—cultivating the garden along the Garden Wall and Berm has been a learning experience. 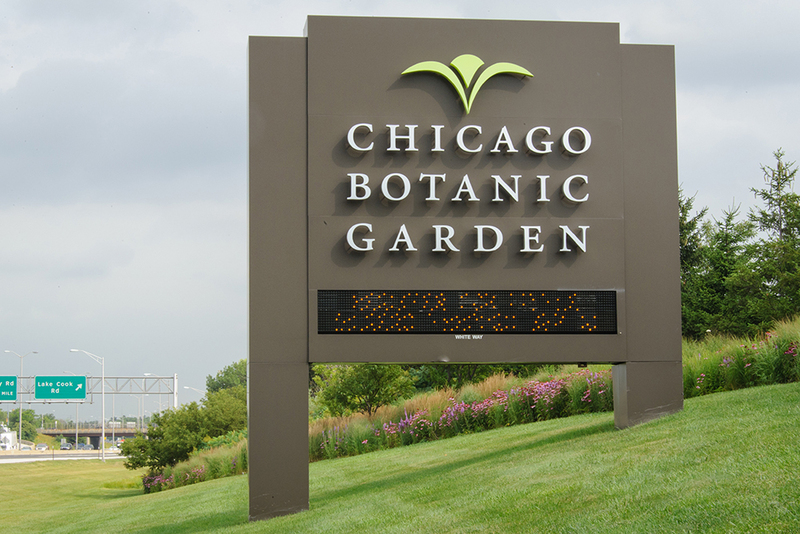 The Garden section in question, located by the big Edens Expressway (northbound lanes) sign. 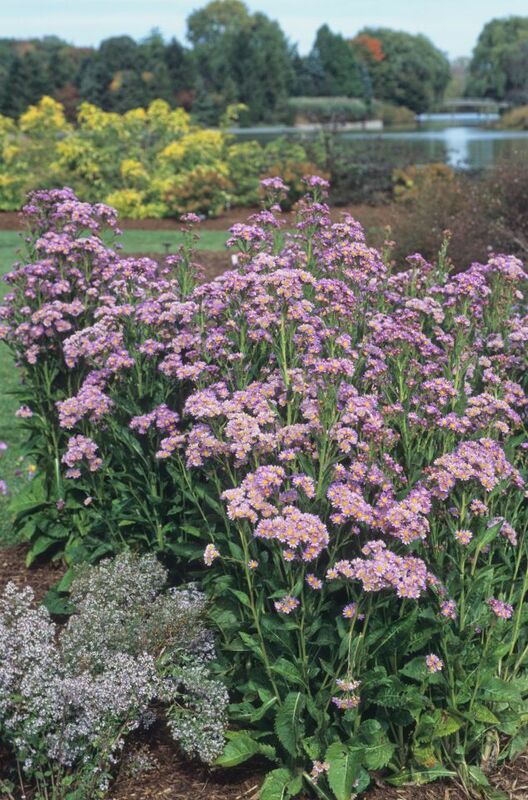 Originally, the design for the perennial border—which you can see trailing up and down the hill behind the big Chicago Botanic Garden sign—included Tatarian aster (Aster tataricus ‘Jindai’), which stands tall in the fall and produces clouds of small lavender-blue flowers well into late October and even November. The problem with this particular plant choice was its aggressiveness. It’s not exactly invasive, but it’s a bully: its roots spread out and then shoot up a new plant every few inches, which produce a forest of these plants. Unfortunately, they soon encompassed pretty much everything in their path. Even the hearty feather reed grass (Calamagrostis acutiflora ‘Karl Foerster’) began to succumb to this persistent tide of plants, strangling down into mere wisps of their former glory. A dense grouping of our problematic asters. Manual removal of the asters was only part of the solution; we needed to find a replacement for these bad boys. 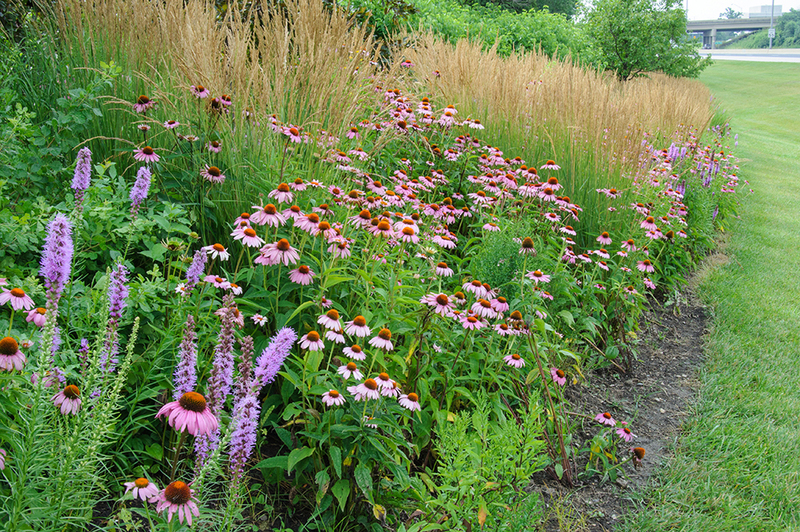 In the process, we revisited the vision for this border, and decided to mix drifts of purple coneflower (Echinacea), blazing star (Liatris), and several varieties of ornamental grasses with a replacement for the original Tatarian asters. The chosen replacement was a smooth aster cultivar, Aster laevis ‘Bluebird’, which is new to the Garden’s plant collection. It bears flowers nearly identical in color to ‘Jindai’ and can grow to the same height as well. Bluebird smooth aster (Aster laevis ‘Bluebird’) is getting along nicely with its neighbor plantings. Furthermore, this cultivar is more well-behaved and doesn’t spread as aggressively. 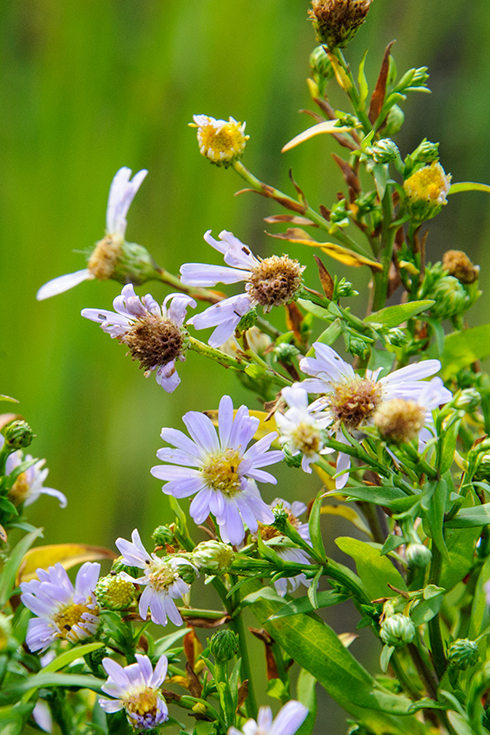 Bluebird smooth aster simply grows bushier in successive seasons—a win/win situation, to be sure. The replanting process took staging and preparation that began with the removal of any grasses that would need to be relocated or divided, and these were heeled into a well-mulched bed located immediately at the site, and watered generously. Additional Echinacea, Liatris, and grasses were delivered and staged for installation. Once all of the ‘Jindai’ had been removed, it was time to plant the new group. The new Bluebird asters came in 2-inch pots and were notably small compared to the 4-foot-tall plants they were replacing; to top it off, these were beginning to bloom in June, so the top half of these small plants needed to be trimmed off, making them even smaller. But we were confident that these plants would be well-sited in full sun, so their potential growth was a slam-dunk. Once the grasses were in place—Panicum virgatum ‘Rotstrahlbush’, Calamagrostis acutiflora ‘Karl Foerster’, and Sorghastrum nutans ‘Sioux Blue’—the rest of the perennials were planted, with the idea of pulling the taller Liatris more toward the middle or back of the border and allowing the Echinacea to fill toward the front. The new asters would eventually stand toward the middle and back of the bed, as tall as most of the grasses. It was important to maintain the colors placed well among the grasses, as they would be the last to bloom. Planting and mulching happened simultaneously to avoid damage to the new asters. This thriving section of the replanted Garden Wall and Berm has a prairie theme: blazing star (Liatris), coneflower (Echinacea), Bluebird asters, and a variety of grasses. That was a year ago, and the border looked fine in the fall, but the question remained—how will it look this year? We’re happy to report that the Bluebird asters are rocking it: they were already as tall in July as their neighboring grasses, and they’re filling out and ready for a spectacular fall display. Of the 3,200 plants that were either moved, divided, or planted anew, the survival rate is exceptionally high: fewer than 1 percent of the plants were lost! It’s mid-August at this writing, and the colors are popping. So, the next time you drive by, carefully check it out, and enjoy this part of a lengthy border of native beauty. For me, Perennial Borders always seem to be in a state of flux. Plants grow bigger than expected (as in this example) or decide to grow in reverse (frustrating the optimistic gardener), or colors don’t work well together and other maladies. Some turn out to be short-lived, so I usually work with a five year timetable. Start off with a three year expectation and start replacing what doesn’t work or is under performing. No plant is expected to be permanent, even tho that would be ideal. Do they still salt the freeway in winter along that stretch? That was a big problem when I was there.